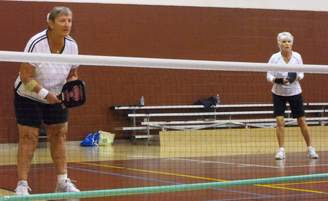 Residents around Southwest Florida are crowding courts to play pickleball, which is sort of like tennis on a badminton-sized court. Area government park departments have started designating courts and hours for the fast-paced, tennis-like game that already has become an event at the Senior Games. “It’s really lots of fun,” Gillis said. “I hope more parks pick it up.” Lazy River Village in North Port may do just that. Residents there will be voting Jan. 17, 2013, at their annual meeting to consider converting one tennis court into three pickleball courts, and building a new tennis court, said Justine Mackie, community association manager at Lazy River. CLICK HERE for full story.